Many, many Record Store Day exclusive releases (for sale only in true old-fashioned brick & mortar record shops like Willimantic Records). Goodie bags to the first 50 customers. A raffle, with cool prizes, to be drawn Sunday evening at 8pm (no purchase necessary). 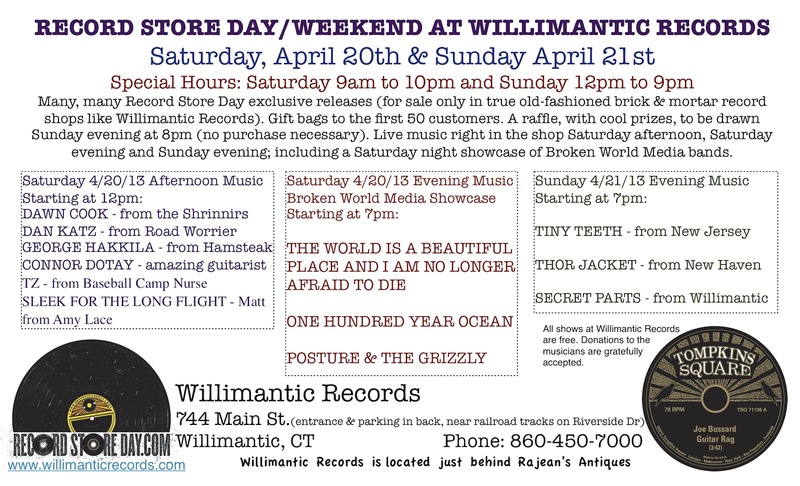 Live music right in the shop Saturday afternoon, Saturday evening and Sunday evening; including a Saturday night showcase of Broken World Media bands headlined by THE WORLD IS A BEAUTIFUL PLACE AND I AM NO LONGER AFRAID TO DIE. Delicious chocolate treats and other refreshments will be available on Saturday at a table Lady Chatelaine's is setting up here in the record store. Scroll down for a full list of weekend performers. If you visit Willimantic Records on Saturday afternoon, do yourself a favor and take a walk through downtown Willimantic. There are many locally owned businesses worth checking out, as well as several excellent dining options. Willimanticdowntown.org has a full listing of downtown establishments and willimanticshops.com provides the opportunity to do some window shopping online beforehand. Saturday night and on Sunday there are fewer shops open, but still plenty of fine choices available for food and drink. All shows are free with donations to the musicians gratefully accepted.